The Maxi-Cosi Pebble car seat is suitable from birth until about 12 months old and can be installed easily. Installation can be either via your car’s seat belt or by the FamilyFix base, whose click-and-go installation makes taking the car seat in and out of your car a smooth process, causing as little disruption to your baby (and your back) as possible. The pebble car seat by Maxi-Cosi is not only comfortable for your baby but, most importantly, it is safe, having been awarded the ADAC Safety Award accreditation, as well as including Side Protection Systems and padded head support. 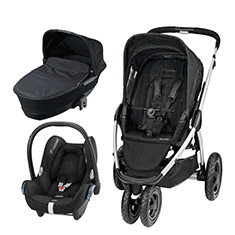 Other popular Maxi-Cosi car seats include the Maxi-Cosi Pearl range.